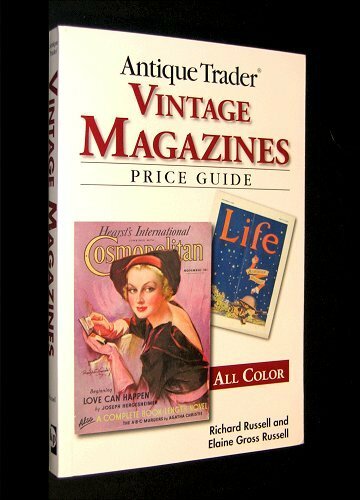 In the introduction to the newly published Antique Trader Vintage Magazines Price Guide, both Elaine Gross Russell and Rick Russell (author of Antique Trader Book Collector's Guide) assert that, until now, no previous popular magazine price guide has been available to collectors. Not exactly so. Those of you who have been hanging around these BookThinking parts for a few years know that, when it comes to books, magazines, paper and related materials, I am a hopeless price-guide junkie and will buy anything - and I do mean anything - I can get my hands on. Also, I'd be ashamed to disclose the number of hours I've wasted at meta search sites typing in phrases like "book guide," "book prices," or any other dumb thing that might have a remote chance of returning the title of a publication I wasn't previously aware of. I'm sure my price guide reference library isn't complete, but let me tell you, it's damn serious. Example: I'm sure I have others, but these are the magazine-specific guides I found on my shelves after only a few minutes search. Count 'em - 8 guides devoted exclusively to magazines, 4 of which have a general (or popular) focus, are relatively comprehensive in what they cover, and have been recently published. Now, my intent isn't to prove anybody wrong; rather, it's to suggest a reason why these guides might be flying under the Russells' (and others') radar. The thing is, you see, they ain't that good. What each one of them does is just what you'd expect them to do - dutifully line up magazine titles, one after the other, in alphabetical order, shove in a descriptive paragraph or two for each, perhaps a few pictures, and inject some (often meaningless and at best fast-obsolescing) values next to individual issues. What each one of them fails to do is organize material in such a way as to help the collector or reseller gain a sense of what to look for. For that matter, some of them outright lack the kind of information that I believe to be essential to intelligent acquisition. You may already know where I'm going with this: flashpoints, those glittering, arresting elements that point to value in books. And magazines. And other stuff. Yes, flashpoints can be culled from good price guides, and a BookThink article showed how. But, it's a lot of work, and even then you may not end up with everything you need. 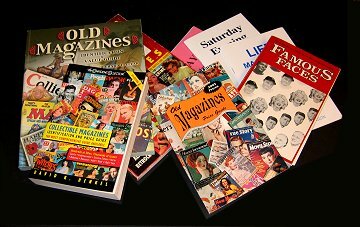 Gold Edition subscribers who received the 2-issue series, "Common Magazines, Uncommon Profits," may recall that I listed 11 primary reasons why magazines are collected. If I attempted to assemble a similar list based only on what appears in the magazine price guides I have, I'd be hard put to get to 5 or 6. And yet I absolutely know that there are more than 5 or 6 reasons because my livelihood depends on it. Magazines aren't just collected for cover celebrities, illustrations and ads, not by a long shot, and my biggest beef with authors and publishers who conspire to produce these and other guides is that they rarely seem to grasp what the reader needs from them. I don't need to know, for example, that the June 15, 1970 issue of Sports Illustrated is worth (c'mon, pull a number out of the hat) $100, $200 or more. Yes, I do very much need to know it's a high spot, but I also need to know why it's a high spot, why the issues that immediately preceded and followed it aren't worth the paper they're printed on - and, though it would be nice to know who Steve Prefontaine was as well, what I need more than anything is a principle I can take away that will help me identify other high spots having nothing to do with him, should I encounter them later. In the Gold Edition, for example, I cited 5 universally applicable reasons why this SI issue is collectible, none of which are specific to Prefontaine (sorry, you'll have the buy issues #10 and #11 to find out what they are). This is what I mean by taking away principle from a reference guide. So, how does the Russells' new guide stack up to my pile of so-so guides? The short answer is: we're putting it on BookThink's BookShelf page immediately so you guys can march right over and buy it after you finish this article.